San Diego Comic-Con tends to be a common home for the Call of Duty franchise. Despite what may have been revealed at E3 or anywhere else along the line, Activision always ensures that the Comic Con audience gets their fix. What better way in 2017 than to offer some of the first glimpses at Call of Duty: WWII Nazi Zombies? And man, does it look exciting. This is not a common Call of Duty element. While rooted in WWII, Nazi Zombies takes a far more horror-like approach to the story. Developer Sledgehammer Games pondered a geeky question: what would have happened if the Germans were able to create such a creature during WWII? From there, things spiraled into a game that is looking to terrify you in an interactive way. Not surprising, considering Sledgehammer Chief Operating and Development Officer Michael Condrey’s roots are tied to Deadspace. What sums it up nicely from the developers: it’s not always about taking things to 11. Sometimes it’s about taking things to 2 and creating much more suspense from there. They really, really want to scare the crap out of you. The cast is going to bring it. Not too long after the trailer, we got to meet the cast: David Tennant (Dr. Who, Marvel’s Jessica Jones), Elodie Yung (Marvel’s Daredevil), Katheryn Winnick (Vikings), and Udo Kier (Blade, Armageddon). Not too shabby at all if you have a Doctor and an assassin rolling around in the group. Not present at the panel was Vingh Rhames (Pulp Fiction, Dawn of the Dead). They’ll represent a diverse cast of non-soldiers. Their backgrounds are more tied to the Monuments, Fine Arts, and Archives section of the Allies – aka Monuments Men. That should be a nice change of pace from a common soldier story. Not all zombies are created equal. Though zombies have been present within Call of Duty games for some time now, WWII Nazi Zombies is its own fresh story. That said, Sledgehammer Games is looking to create a familiar style that will appease long time fans, but also allow a fresher take on the franchise. The gameplay is meant to be approachable for all gamer types, though perhaps not as zany as some of the original gameplay. 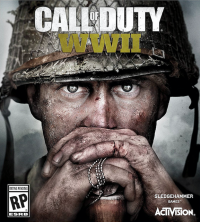 Call of Duty: WWII releases November 3, 2017 for the PlayStation 4, Xbox One, and PC. San Diego Comic-Con tends to be a common home for the Call of Duty franchise. Despite what may have been revealed at E3 or anywhere else along the line, Activision always ensures that the Comic Con audience gets their fix….